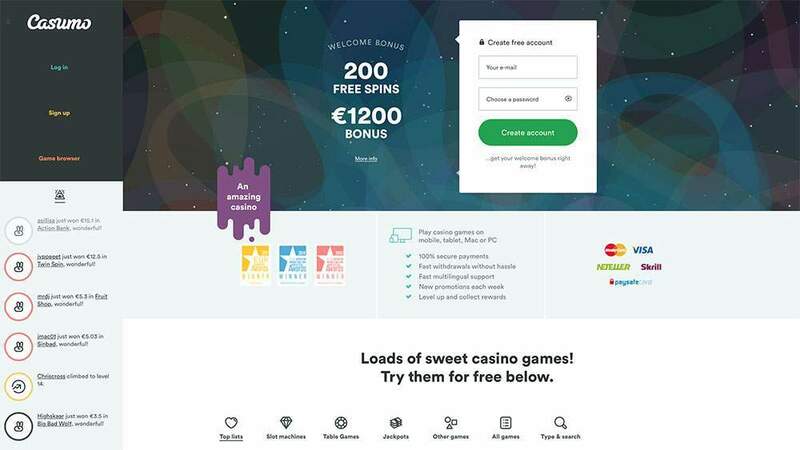 Casumo is an online casino with a strikingly modern direct-play interface, fully mobile and with a unique promotional system. The site has a simple no-nonsense appearance and a very wide selection of games from NetEnt, Microgaming, Greentube, WMS (Williams Interactive) Quick Spin, Play’n Go, IGT, Bally Barcrest and Thunder Kick. Casumo Casino is licensed in the jurisdiction of Malta and the UK Gambling Commission. Of course terms and conditions apply to all bonuses and promotions of Casumo casino. Casumo Casino offers games from numerous suppliers including the renowned NetEnt platform. The most popular games are the slots, known for their innovative features, stunning graphics, and playability. Some of the most popular five-reel video slot titles Magic Portals, Evolution, Starburst, Jack Hammer, Gonzo’s Quest and Muse Wild Inspiration. Some traditional three-reel games are also here to play like Gold Rush and Magic Love. Table Players have a large selection to choose from at Casumo Casino. The number of blackjack and roulette variants is impressive. In addition, there is also Baccarat, Casino Hold’em, Caribbean Stud Poker, Trey Poker, Texas Hold’em Bonus Poker and Oasis. The Casumo video poker selection includes both single hand and multi-hand versions of four different variations: Jacks or Better, Deuces Wild, Joker Wild and All American Poker. Players can choose to play simultaneously up to 100 hands with flexible deployment options. In addition to the virtual games, players can enjoy at Casumo Casino roulette and blackjack against real dealers in the Live Casino rooms. You really feel like in Vegas but then just do your own couch. Most games can be played directly on all major smartphones and tablets. When you go to the Casumo website on a mobile device, you will be automatically redirected to the mobile version. The mobile site includes the most popular slots and games and you can easily access your account. Additionally, Casumo has a handy iOS app! Casumo has a very friendly customer service. Players can always contact when they have a question or problem or even just want to give feedback via the live chat feature. The Casumo Ambassadors are available 24 hours a day, 7 days a week. Another option to get your answer is available via email or the extensive FAQ section on the site. Casumo Casino has taken the necessary steps to protect players. Detailed information can be seen on the “About Casumo” page on SSL encryption and privacy protection, both of which ensure that sensitive data will remain confidential. Players who have questions can contact the support department. The NetEnt platform is absolutely fair play and this has been proven countless times by independent audits by the TST, as indicated by the “RNG Certified” seal at the bottom of the website. Payment Methods: Bank Wire Transfer, MasterCard, Neteller, Paysafe Card, Visa, iDEAL, GiroPay, Skrill, PugglePay, Sofort (by Skrill). Withdrawal Methods: Bank Wire Transfer, Neteller, Visa Electron, Visa, Skrill. American Samoa, Australia, Austria, Bulgaria, China, Croatia, Cyprus, Czech Republic, Denmark, Faroe Islands, France, French Guiana, Guadeloupe, Guam, Hong Kong, Italy, Latvia, Libya, Lithuania, Macedonia, Marshall Islands, Martinique, Moldova, Montenegro, North Korea, Northern Mariana Islands, Palau, Poland, Puerto Rico, Romania, Réunion, Slovakia, Slovenia, Spain, Turkey, U.S. Minor Outlying Islands, U.S. Virgin Islands, United Arab Emirates, United States. Casumo casino carries our reward of excellence seal that is only awarded to online casinos that meet our standards with an average of 8/10 or higher. With this seal we also state that Casumo is a fully trustworthy casino with a good service for its players.